Thanksgiving is approaching soon and Nikolai's birthday will be one day before Thanksgiving this year. As you can imagine, we will be quite busy, but on the bright side, there will be no school on his birthday. I believe I've mentioned before that I usually start my Christmas shopping months before November but this year I've not even started yet! I'll have to need to start shopping as soon as possible. Not that I'm complaining, I LOVE shopping. Bento making should be all about having fun and never something about which you should feel intimidated. You should ignore any suggestion that bentos are too much work, or take too much time, or that they need to be based on Japanese food, for none of that is necessary. It’s really all about adding that bit of fun, color and whimsy to a meal. And sometimes that extra cheer can make a big difference in a day. 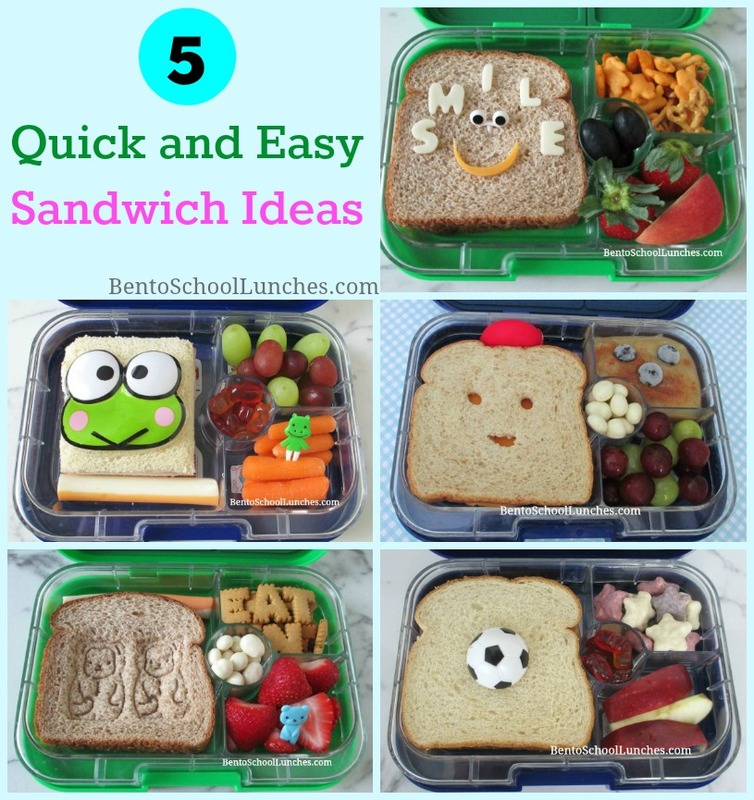 Here are five examples of how one can add a little something extra to a plain sandwich. 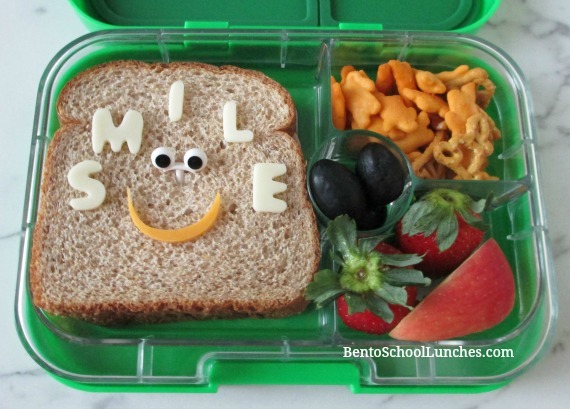 Bento lunch 1: Cheese lettering. I created the letter SMILE from my alphabet cookie cutters, included a cute eye pick and a cheddar mouth. Alongside are Annie's organic crackers, seedless grapes, apple slices and strawberries. 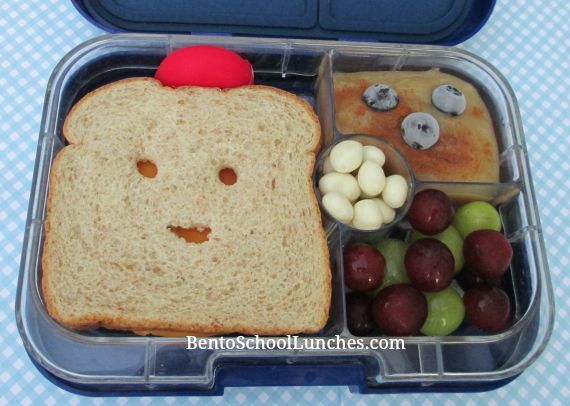 Bento lunch 2: Face cutout. Simple sandwich which I used a mini circle cookie cutter for the eyes (you can use a straw as well) and free hand cut the mouth. His sides were a babybel cheese, organic apple sauce with extra cinnamon topped with frozen blueberries, yogurt covered raisins and seedless red and green grapes. 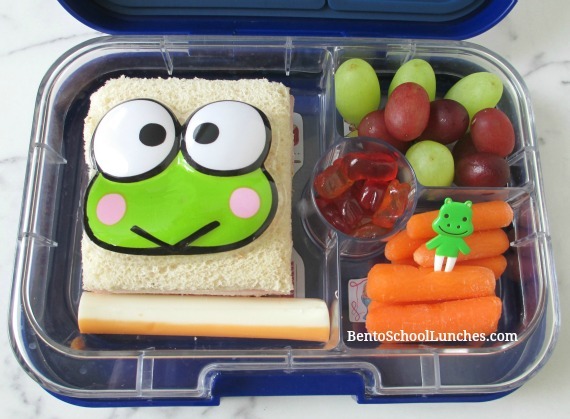 Bento lunch 3: Topped with a topper or baran: I love Keroppi and used our Keroppi topper on a sandwich, how easy is that. His sides were string cheese, seedless grapes, Annie's organic fruit snack, organic baby carrots with a pick. 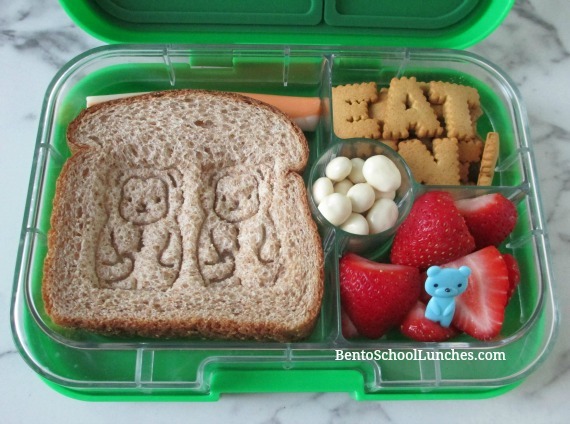 Bento lunch 4: Stamped sandwich. I've not used my CuteZCute Animal Palz in a long time and use the monkey stamper on this sandwich. His sides were cookies from Ikea, string cheese, yogurt covered raisins, strawberry pieces a pick. 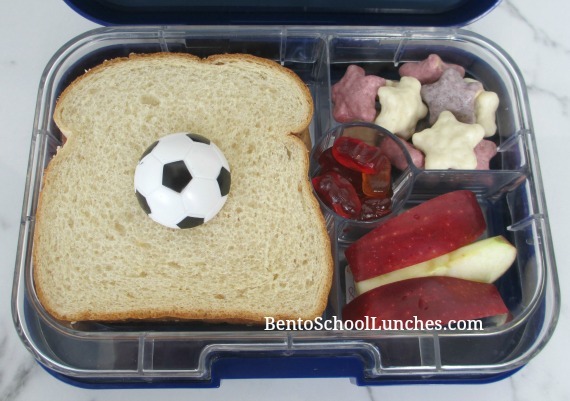 Bento lunch 5: Use a cupcake ring or a food pick. This is one of the easiest of them all and also the day when we are low on groceries. I used a cupcake ring on the sandwich, Trader Joe's yogurt stars, Annie's organic fruit snacks and organic apple slices. These lunches look great! Have fun shopping!